Don Giovanni Hotel Prague is a 4-star hotel located in Prague's popular residential area of Vinohrady in close proximity to the city centre. The Hotel has great connectivity with the centre - it is located directly on the underground station Zelivskeho and the tram / bus stop. You can reach the historical centre within 10 minutes. 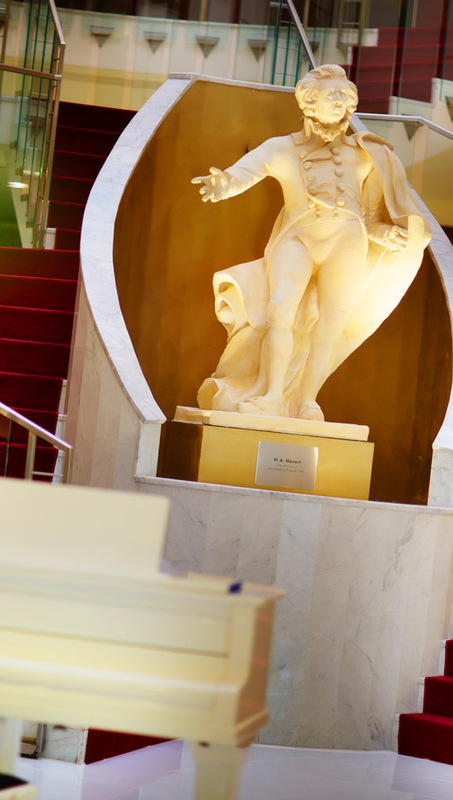 It is a modern city hotel built in 1995 and it is named after Mozart's opera Don Giovanni. Near the hotel is one of the biggest indoor shopping centres in Prague, "Atrium Flora". The Hotel provides 411 spacious, air conditioned guest rooms, the majority of them offer exceptional views of Prague. Don Giovanni has 5 restaurants and bars (Allegretto, Teatro I and Teatro II, Amadeus lobby bar and on 12th floor the Executive Lounge with roof terrace). The Hotel also has one of the biggest conference / meeting capacities in Prague. Conference rooms offer daylight and are connected with the hotel terrace. Leisure time facilities include the "Spa and Fitness Centre" on the 12th floor of the Hotel. Other services provided by the Hotel are the beauty salon, gift shop, concierge, secretarial services, internet centre, indoor car parking and porterage. On the airport take bus number 119 and go to station called “Nádraží Veleslavín”, it is the last stop. Change to subway line A. Take the direction to “Depo Hostivař”. Go directly to station “Želivského” (it is 10th stop). Our hotel is situated just next to the exit from subway. Czech traffic regulations are almost identical to those in effect in other European countries. In the Czech Republic you must drive on the right, put on your seat belt and keep your headlights on, even during the day. Alcohol consumption prior to and while driving is strictly prohibited. Speed is limited to 50 KM per hour in build-up areas, 90 KM per hour on roads and 130 KM per hour on highways. There is a fee for use of highways in the form of highway stickers; these can be purchased at border crossings, gas stations and post offices. Driving directions can be obtained from www.map24.com. Hotel has 200 parking spaces, which are monitored by security and cameras 24/7. The price is 20€/day and reservation is not necessary. From the train station go by subway to station Muzeum (it is on the line C). On Muzeum you have to change the line to the green one A. From there you go to station Želivského (it is 4th stop), where you will get out. Our hotel is situated just next to the exit from the underground.